NFPA's NEC® online training is approved by your state as continuing education for electrical professionals. All you need is a computer and a Wi-Fi connection to earn continuing education credit towards your electrical license renewal.. NFPA's state-approved online training programs let you work at your own pace to update your National Electrical Code® knowledge and learn the latest techniques for keeping personnel safe from potentially deadly electrical hazards. The 2014 National Electrical Code Online Training Series advances your ability to navigate and apply the NEC. Interactive lessons developed by the nation's leading electrical code experts cover NFPA 70: NEC scope and organization, general installation requirements, conductor sizing, overcurrent protection, and grounding and bonding for systems and equipment. Six modules address Code application across occupancy types. Each module ends with an exam to test your knowledge. Enroll today! Now you can improve your skills while you earn continuing education credit accepted toward your electrical license renewal. Take advantage of NFPA's convenient and effective online training solutions for NEC users. Complete this six-hour course series and qualify for 0.6 CEUs. Completion of each individual one-hour course qualifies you for 0.1 CEU. Upon successful completion of the course series, participants will be prompted to download the CEU certificate directly from the course site. Please verify applicability with your professional board or organization before registering. 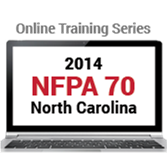 If you would also like to learn about, see which states have approved, and register for 2015 NFPA 70E Online Training, please click here. Course Tuition: The course tuition is due and payable before starting each module. Expiration: Participants will need to take the online courses or series within 180 days. CEUs: You earn 0.1 CEU for each learning hour. To verify total numbers of CEUs for a course or a series, please check the Description tab. Upon successful completion of a course or a series, participants will be able to download the CEUs certificate directly from the website. Please verify applicability with your professional board or organization. View FREE interactive demonstrations of online training here.